Absalom's Wake is my newest release from Biting Dog Publications--but with a difference! Instead of being published in a single volume, it is being published in serialized installments, just like the old adventure serials of the 1940s, and before that, the serialized novels that appeared in the pulps! There will be six installments. The first installment, Absalom's Wake: Gone A Whaling is currently available, and the second installment, Absalom's Wake: Blood On The Beach, will be released shortly via Kindle,Kobo, iTunes,Nook, Sony eReader and Smashwords. Absalom's Wake is a historical dark fantasy, set on a whaling vessel in the 1840s. The narrator, young Jonah Padgett, grew up listening to the tall tales spun by his beloved Uncle Calvin--a former whaling man forced to retire after losing his legs at sea--and has left home to sail the world as one of the crew aboard the Absalom, under the command of his uncle's old friend, Captain Solomon. 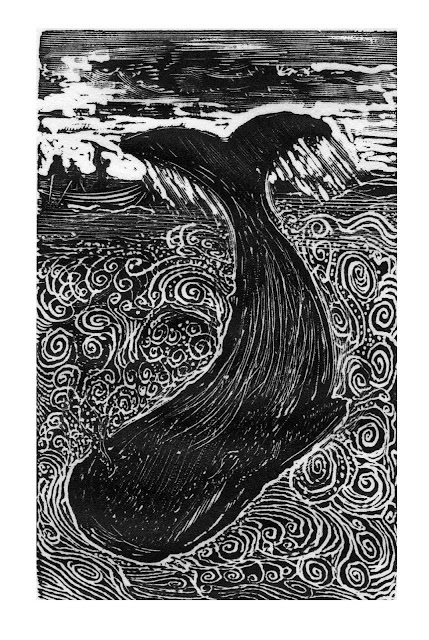 Upon rounding the Horn, the crew hears stories of "King Jim", a whale as big as a mountain, with skin as black as a bible, and in command of a harem of a hundred females. Captain Solomon is determined to make his fortune hunting down the elusive monster whale.But when the Absalom signs on the strange native called Koro as harpooner, the ship finds itself plagued by inexplicable disappearances and horrific death, which eventually pits shipmates against one another for fear of their lives. Young Padgett soons finds himself adrift in a fantastical and exotic world filled with dolphin-like merfolk and nightmarish were-sharks, endangered equally by inhuman creatures from the ocean's depths and human superstition and fear--his life at the mercy of something as old and mysterious as the sea itself.